Buteogallus is a genus of bird of prey in the family Accipitridae. All members of this genus are essentially Neotropical, but the distribution of a single species extends slightly into extreme southern USA. 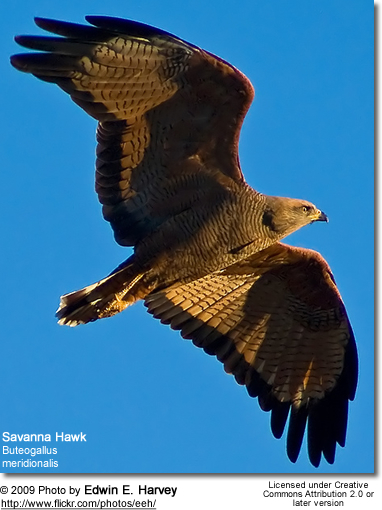 Most are known as black-hawks (though not all species are dark) or mangrove-hawks (though can also be found far inland). For the entire group the name crab-hawks seems most apt, in reference to the fact that all species are quite fond of large crustaceans and will even patrol long stretches of shore or riverbank on foot where such prey abounds, but there are a number of birds with somewhat different lifestyle which appear so closely related that they ought to be included here. Almost all species have a very characteristic tail pattern. This consists of a black base, a wide white middle band, a roughly equally wide black band, and a quite narrow white band on the feathertips that is often hard to discern or may be lost when the feathers are very worn. In the Great Black-hawk, the basal black is either missing or wider depending on subspecies, but in the former case the body near the tail base is black, resulting in an almost identical appearance. Only the Rufous Crab-hawk has a very different tail pattern (see also below). 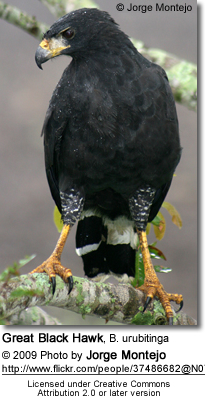 Mangrove Black-hawk, Buteogallus (anthracinus) subtilis – formerly considered a distinct species, but now considered a subspecies. However, delimited so strictly the genus is probably paraphyletic (= some, but not all, of the descendants from a common ancestor). 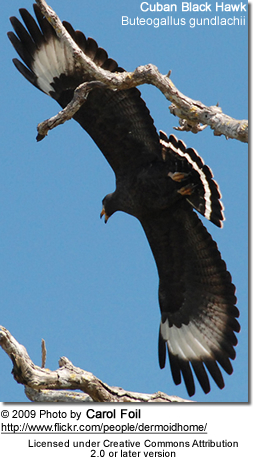 The solitary eagles (Harpyhaliaetus) are a more continental relative of the "black" group of Buteogallus – in phenotype they are essentially hefty Common Black-hawks with lighter body plumage and in one species a small tuft. Insofar as there are differences in anatomy, these seem to be related to the different prey they hunt (namely reptiles). 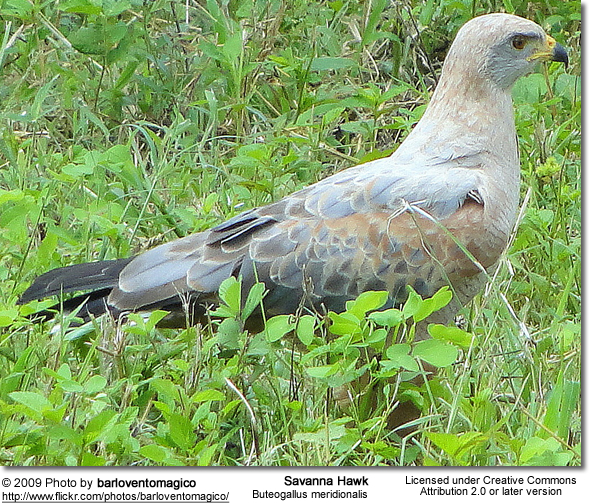 Together with the Savanna Hawk, they seem to be close to some species uncomfortably placed in Leucopternis. As that genus is apparently polyphyletic (derived from more than one ancestral type), it seems as if the best course of action would be to unite the crowned eagles with Buteogallus, as well as some "Leucopternis", to agree with the morphological and mtDNA sequence data. These would include the Plumbeous Hawk (L. plumbeus) and the Slate-colored Hawk (L. schistaceus), which since long were proposed time and again to be placed in Buteogallus. Together with the crab-hawks and solitary eagles form a sequence of plumage patterns that nicely agrees with the DNA-based phylogeny: L. schistaceus looks very much like a smaller, shorter-legged and lighter Common Black Hawk, while the basal L. plumbeus lacks the tail pattern. The case of the White-necked Hawk (L. lacernulatus) is more puzzling. It is visually and ecologically almost identical to the sympatric Mantled Hawk (L. polionotus) and some allopatric White Hawks (L. albicollis) but differs in tail color. According to the mtDNA data, it is very closely related to the Savanna Hawk, which is visually completely unlike, appearing like a very light Buteogallus which has an ochre-grey coloration due to abundant pheomelanins. Either there has been strong convergent evolution in plumage and ecology - perhaps a case of mimicry - between the White-necked and the Mantled Hawks, or the mtDNA data is misleading due to ancient hybrid introgression. In the respect, it is interesting to note that the White-necked Hawk specimen sampled showed indications of heteroplasmy. The placement of the peculiarly apomorphic Rufous Crab-hawk in regard to all these birds must be considered unresolved for the time being. The fossil record of Buteogallus has meanwhile turned out to be quite rich indeed, with many species being erroneously assigned to other genera at first. The genus – like many buteonines of today – probably succeeded earlier birds of prey during the Miocene and never seems to have occurred outside the Americas. From the time of the last ice age, an array of prehistoric species is known, some of them very large. On Cuba, a particularly gigantic species survived deep into the last ice age, but probably not until human settlement. In addition, if the solitary eagles merged into Buteogallus, the prehistoric Amplibuteo would almost certainly have to be merged herein too, as it is hardly distinct from Harpyhaliaetus.